The Intense Pure Air is an air purifier that is claimed to filter 99.97% of pollutants and permanently capture and destroy formaldehyde. 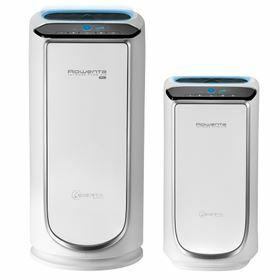 The Intense Pure Air is offered in two sizes, the ‘Bedroom’ purifying up to 400 square feet and the ‘XL Room’ purifying up to 835 square feet. Both models are claimed to feature smart pollution sensors that provide automatic filtration regulation. A timer allows users to set operating duration from 1-8 hours and three modes of operation allow for ultimate performance: auto, night and manual. The air purifier offers four levels of filtration. These include a pre filter to filter dust, hair, animal hair, as well as an active carbon filter to filter odours, smoke and VOCs. A HEPA filter is employed to filter fine dust (PM 2.5), such as pollen, dust mites, animal allergens, viruses and bacteria. Finally, a Nano Captur filter traps and permanently destroys formaldehyde.